Slight exaggeration in the title? Me thinks not! A quick review of my 102 kindle notes (yes 102) shows that this guide is by far one of the most practical I’ve come across! If you like John’s book then also check out his website for loads of useful videos and ebooks. I think my favourite concept of John’s is the marketing funnel concept he uses: 7 phrases of the hourglass. The funnel addresses these stages: Know, Like, Trust, Try, Buy, Repeat, Refer. If you’ve ever struggled with marketing then I can tell you with absolute confidence that if you start thinking of it as a funnel like this (or an hourglass if you prefer) then you’ll find it 10x easier. What shall we do for our marketing this year? For a start, most people with this question will jump straight to promotion. E.g. some more ads in the paper, we need a Facebook page! and so on…. How do we move people through the marketing funnel and how can we improve this? > Know, Like, Trust, Try, Buy, Repeat, Refer. Now we’re getting somewhere! Perhaps you’re being let down at the ‘try’ stage so you decide to implement a free 30 day trial and evaluate. Anyway, I slightly digress from the great book! “Finally, at the very least, ask your prospects, and even your Web site visitors who fill out a form to request a free report, where they heard about you. Just tape this question near the phone of everyone in the office, and tally the results often. 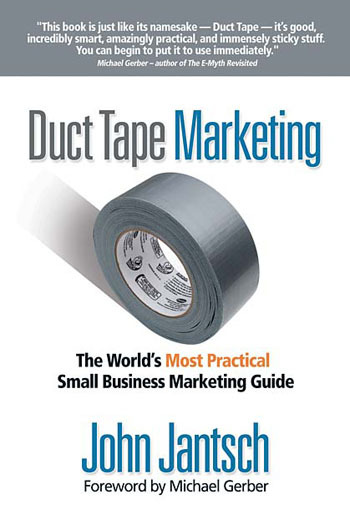 Get Duct Tape Marketing here. And if you love it (like me) then check out the author page for plenty of others. I’m yet to read it, but the referral engine looks pretty dam good.